Posted On May 12, 2016 by Team iCynosure. A few years ago I travelled to a county full of rugged mountains and sandy beaches, with an ocean of ancient reefs thrown in and acres of rainforests to escape into. It was by far one of the perfect places to experience an exciting post-graduation rush with friends and feel the air of freedom. We chose plush five-star hotels against cosy home stays, followed a tight itinerary and dived straight into exploring the must-visit spots. We were in Malaysia, a perfect home away from home. However now that I am no longer as young as I used to be, I wish to visit Malaysia yet again; however, this time without an itinerary, opting to stay in cosy home-stays and discovering the country's multi-cultural diversity. I'd first want to take a direct flight into the country with Malaysia Airlines and land into Kuala Lumpur. Even though the capital city of Malaysia is full of tourist attractions and experiences from child friendly parks and enormous wide life to renowned world heritage sites contrasting man-made towering skyscrapers, tantalizing food and shopping delights; I'm going to book in such a way that my Flight Schedule allows me to take a connecting flight straight into the Malaysian Borneo. Sabah fondly called the land below the winds has been my dream destination since my first visit to the country. With rich natural experiences including the Tabin Wildlife Reserve, the Orangutan Rehabilitation Sanctuary, the Ranau Pouring Hot Springs, the gorgeous Sipadan island for diving among large pelagic species to muck diving at Mabul; Sabah is the perfect natural retreat for every traveller - adventurous or wildlife lover or one looking for leisure. However, I want to head straight to Kinabalu National Park to experience a once-in-a-lifetime climb of Mt. 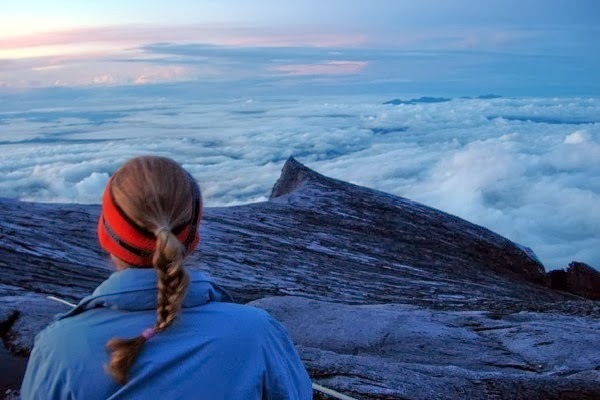 Kinabalu and witness the other end of the world beyond the clouds. Climbers have penned their experiences and just reading them gives me goosebumps. The two day scheduled climb takes a climber to the summit at Low's Peak to witness a spectacular view from 4095 meters above sea level. I'm sure I'd feel on top of the world with a view that will reach beyond the vision of my eyes, a climb that will give me a new perspective to life. From the relaxed ascend up to Layang-Layang to the difficult climb to Laban Rata, climbers have witnessed the beauty of rainforest trails and the rocky trails, navigated through steep inclines and uphill turns. After all the trials the thick forest will finally open up into a rocky plateau of Laban Rata guesthouses, where climbers retire for the night. The next morning each step of the way to the Sayat-Sayat checkpoint offers exhilarating views in all directions... St John's Peak to the west, the Donkey's Ears to the east and the distinctive South Peak to the south shall give climbers a glimpse of what's to come. And then the dream to sit back and soak in the sunrise at the top of the peak will make the world stand still. That's the one moment I want to experience and be mesmerised in awe and happiness.